Originally uploaded by Linda N..
I’ve been traveling and working a lot, but I have also been knitting. Really. 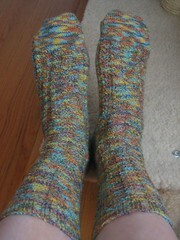 Above are the socks I was writing about a couple months ago: my first toe-up socks made with Knit Picks Dancing yarn. As you can see, they turned out well, despite all the frogging. I actually finished these in June, but didn’t get around to photographing them for a while. By Thursday of this past week, both the weather and my body were in sync for once and I was finally able to do some gardening. (With my jet-lag and the EXTREME heat and humidity we’ve been having, getting anything done in the yard has been a challenge.) I didn’t pause to take photos, but believe me the raspberry patch was a jungle. Raspberries really aren’t that complicated to grow and they require little attention from the gardener. I have black, red, and yellow raspberries. There is some variation in caring for them, but the general guidelines are the same. If you want to get all technical, the terms to remember when it comes to raspberries are primocanes and floricanes. Primocanes are the new canes that emerge within a growing season; floricanes are last year’s canes. Black raspberries bear fruit only on the floricanes; red and yellow raspberries bear fruit on the primocanes, but will also fruit on the floricanes if you prune them in season 1, and let them stand over the winter. Got it? Here’s how it works in reality. The black raspberries only bear once a year, in the early summer. After the harvest, the canes that fruited get cut to the ground. Shortly after that, it’s time to prune the primocanes that emerged this year. They need to be lopped off so they’re about 3 feet tall. If they’re not pruned down, they snake all over the place and will root themselves if they can. 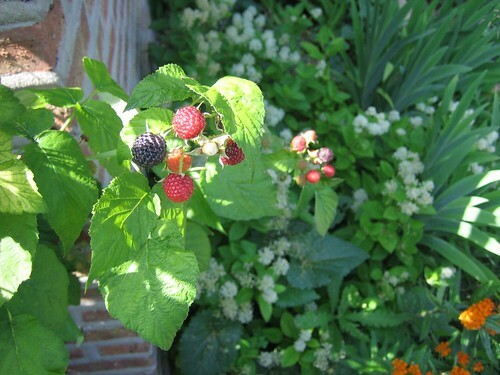 (The black rapsberries also have thorny canes, so it’s highly unpleasant to walk into one of those long, snaky canes if they haven’t been pruned.) Plus, this pruning also makes the plant put out horizontal branches, which are the ones that bear the most fruit. So, by lopping them off, the gardener is forcing the plant to produce many fruiting branches. Although the “official” guidlines don’t mention this, I usually end up doing a pruning of these horizontal branches in the spring, too. By then the horizontal canes have become really long and need a bit of controlling. The yellow and the red raspberries send up new canes in the spring/summer that bear fruit in the late summer. After they bear, I prune off the top of the cane where they’ve fruited, and leave these canes to overwinter. In the early summer, those canes bear fruit again, and then I prune these floricanes to the ground. In the meantime, a bunch of new primocanes have sprung up and by this time of year are already flowering and setting fruit. So, I get two batches of fruit from them: one in the early summer and one in the late summer. I was WAY behind in pruning out the canes that had fruited earlier this summer, so it was a crazy mess of new and old canes in the ‘ol raspberry patch. This was bad not just ’cause it’s poor gardening practice, but also because the compost bins are across the path from the raspberry patch and we had to sort of wiggle our way into this jungle to dump our compost. Thursday night was pretty productive for me at home. After getting all sweaty and sticky from tackling the raspberries, I cooled down by bathing the dogs outside with the hose. I thought the cool water was refreshing, but I guess they didn’t. Yesterday it was cool enough outside to finish up more overdue gardening chores. I weeded the veggie patch, picked beans, and dug up the garlic. Nobody had picked anything in the garden for nearly 2 weeks, so most of the beans were added to the compost bin. (My neighbor was going to tend the garden for me while I was gone, but she ended up being really ill and unable to do so; Mark just wasn’t sure what to do.) I’m disappointed in this year’s garlic harvest, too. The bulbs are all pretty small. Actually, I had dug a few up before I left, but thought that if I left them in the ground a bit longer perhaps the bulbs would get bigger. No chance. Instead, the plants withered even more and the garlic was starting to sort of rot in the ground. Yuck! Today I’m just going to kick back and enjoy my home, I think. It’s good to be back. * For those who may not know, OKC = obligatory knitting content; OGC = obligatory gardening content. Lots of work, for sure, but also periods of fun, fun, fun. I had a wonderful birthday week, including gifts from friends and a cake presented to me at WWKIP. Jamie gave me homemade gifts: handspun yarn and a necklace, and Rachael gave me a beautiful Dracinia that is now gracing the upper porch. Mark bought me a video iPod, which I think I’ve finally gotten used to. And the following weekend, my sister presented me with a wonderful picnic dinner that we enjoyed while enjoying School of Rock at Independence Park (one of the Chicago Park District’s Movies in the Park events). So, it hasn’t been all work and no play. The garden beds are taking good care of themselves. At this time of year, I only have to make sure it stays watered, do some light weeding, and enjoy the fruits of my labors. A ripe black raspberry, on the bush and ready for picking. All this was harvested just today. Plenty more to come! Giant berries! 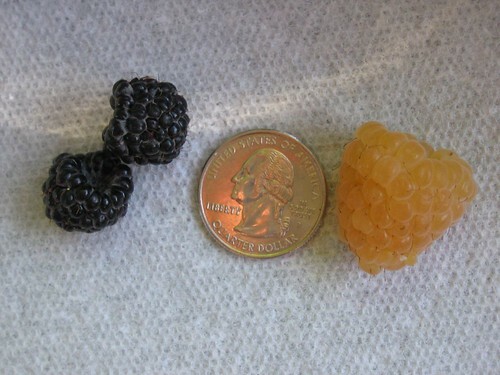 Look at the size of the yellow raspberry on the right. Geez, you’d think I was feeding the plant my own blood. No, this isn’t Little Shop of Horrors in my backyard. 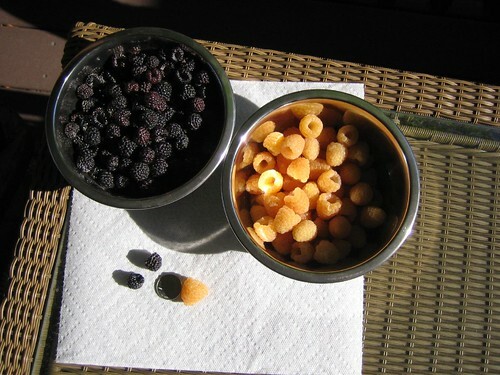 All the yellow raspberries are huge for some reason. Obviously, the black and yellow raspberries have started to ripen. The red ones are always a week or two behind for some reason. Well, Blogger isn’t letting me show you any more photos right now, so I may as well sign off. We’ve got a bottle of wine to consume and a pizza to cook. Ah…I love Friday nights!